Trial & Appellate Practice in the Insurance & Corporate Defense Litigation Area Wilson & Berryhill is a law firm committed to the delivery of the highest quality legal representation and advice to its clients and seeking the clients' desired results as quickly, efficiently and as cost effectively as possible. The attorneys have had exposure to a wide range of clients and varying types of litigation. As a result of these experiences, our attorneys have come to understand our role in the legal system. Our primary role is early evaluation of the case based upon the information available, consultation with the client to determine the desired objective or result, gathering all relevant information from all identifiable sources, assimilation of all facts and applicable law into an organized and understandable form, and zealously representing the client's best interests. Our firm is committed to honest billing practices to insure the client receives the full benefit of the firm's best efforts at a fair price. David, then serving as the managing partner of the Birmingham office of a regional law firm with offices in Alabama and Florida, hired Jonathan as an associate in 1997. 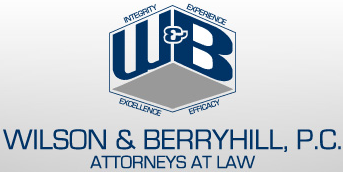 In 2001, David and Jonathan formed their own firm, Wilson & Berryhill, P.C., where Jonathan serves as the managing partner. The firm name may have changed, but the level of personal service and devotion to fair billing practices has continued. The firm acknowledges the important contributions of several long time staff members, including Rebecca Hall, Michele Turner, Ginger Johnson, Lisa Hicks and Linda Vance, who bring professionalism and competence in performing their critical work for the attorneys, as well as stability to the functioning of our office. Wilson & Berryhill, P.C. celebrates its ten year anniversary as of April 1, 2011. Since its establishment, it has increased from its original two lawyers to six lawyers. The firm has achieved steady and controlled growth in its client base. The shareholders of the firm are grateful to the loyalty of its longstanding clients, some of whose relationships with David Wilson date back twenty plus years, and we also appreciate the trust and confidence which the more recently acquired clients have placed in the firm by permitting us to advise them, and represent them and/or their insureds in important legal matters. Wilson & Berryhill, P.C., an AV rated firm by Martindale Hubble, is devoted exclusively to litigation of civil lawsuits, arbitrations, mediations, administrative hearings and appeals in all state and federal courts within Alabama. Our primary practice areas are defense of general civil litigation (also commonly referred to as " Insurance Defense"), motor carrier negligence, premises liability, dram shop claims, workers' compensation, insurance coverage and defense of bad faith, and appellate advocacy. What We Do... Our purpose is to achieve the client's desired result in the most effective and efficient manner possible. Whether the goal is early settlement or zealous representation through trial, we are equipped to assist our client through the litigation and alternative dispute resolution process. Where We Go... Our firm is retained to defend a broad range of matters across the entire state of Alabama, from Mobile to Scottsboro, Florence to Dothan, and literally all points in between. Our attorneys have actually tried cases in 52 of the 67 counties in Alabama, and in each of the 3 federal districts in Alabama. Areas of Law: -General Insurance Defense -Trucking Litigation -Workers Compensation Defense -Employment Practices -Insurance Coverage -Insurance Agents and Brokers Defense -Insurance Agents and Brokers Errors and Omissions -Insurance Bad Faith -Motor Carrier Defense -Trucking Liability -Products Liability Defense -Premises Liability Defense -Dram Shop Liability -Automobile Liability Defense -First and Third Party Insurance Defense -Insurance Bad Faith Defense -Insurance Coverage Defense -Workers Compensation -Workers Compensation Mediation -Workers Compensation Self Insurance -Workers Compensation Subrogation -Workers Compensation Appeals -Liquor Liability -Alternative Dispute Resolution -Arbitration -Mediation -Appellate Practice -Civil Appeals. Our attorneys represent small- to mid-sized businesses in a variety of matters. We are dedicated to assisting clients in achieving goals they set for themselves and their businesses. Our attorneys provide services ranging from the start up of business, establishing safety policies, negotiating and drafting contracts and general business issues. Birmingham Bar Association; Alabama State Bar; Alabama Defense Lawyers Association; Alabama Workers Compensation Organization; Defense Research Institute; Alabama Worker's Compensation Defense Lawyers Association; International Association of Defense Counsel; Trucking Industry Defense Association. Birmingham Bar Association; Alabama State Bar; Alabama Workers' Compensation Organization; Alabama Defense Lawyers Association; Defense Research Institute; Alabama Worker's Compensation Defense Lawyers Association. Alabama Workers' Compensation Defense Lawyers Association; Alabama Defense Lawyers Association; Defense Research Institute-Insurance Committee. Birmingham Bar and American Bar Associations; Alabama State Bar; Alabama Defense Lawyers Association; Defense Research Institute. Birmingham Bar Association; Alabama State Bar; Alabama Trial Lawyers Association.